Our Tuesday night sketch group is now an official Urban Sketchers group, known as Urban Sketchers SF Bay Area. 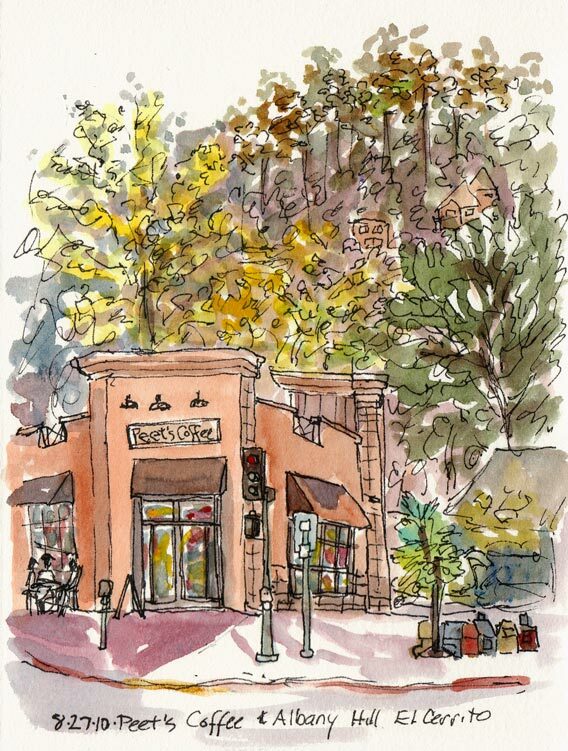 If you’d like to visit our Urban Sketchers blog, you’ll get to meet my fellow Bay Area sketchers and see the different ways we interpret scenes in our sketchbooks, often from the same viewpoint. The sketch above was done while sitting on the steps of the Pier One across from Peet’s in El Cerrito. It was the first sunny day in ages and it felt so good to enjoy a latte and some sketching in the sun. Albany Hill sticks up right behind Peet’s. It’s an odd bit of geography that resembles a very tall cupcake (sprinkled with trees instead of jimmies) in an otherwise flat landscape. In the late 19th century, the Judson Powder Works used the hill for the manufacture of dynamite. The company was forced to move from San Francisco and then Berkeley because of continuing accidental explosions. They planted the eucalyptus trees on the hill to catch debris and muffle the sound of their explosions. The stop on the transcontinental railroad tracks just to the west was called Nobel Station, after the inventor of dynamite. In 1905, a massive accidental explosion of nitroglycerin killed 23 workers. The explosion carved a massive crater in the north flank of the hill, which is still visible today as a large dip in the tree-line. After this incident, dynamite making was forced north to less-settled areas, making an eventual last stand at Pt. Pinole, now a regional park. Quarrying on the hill continued for many years, leaving scars on the rock and eventually obliterating a low summit northwest of Albany Hill, where Pacific East Mall is now located. As a large open space, the only nearby high elevation next to the Bay, and in the path of sea winds blowing through the Golden Gate, Albany Hill is an ecological island. It is a haven for plants normally found in much cooler areas and harbors unusually large numbers of native wildflowers and other plants. The oak forest on the cool north face remains much as it was pre-European-settlement. The non-native Eucalyptus trees on the summit attract migrating and wintering Monarch butterflies. Hawks, owls, and deer are among the animal inhabitants; herons, kingfishers, and egrets fish the creek. Another great sketch and interesting post! Congrats on officially becoming an urban sketcher! Great news indeed! Excellent sketch! I really like your sketch/painting. It is particulary pleasing. Sketchers. I’m going right over to see each one of you.